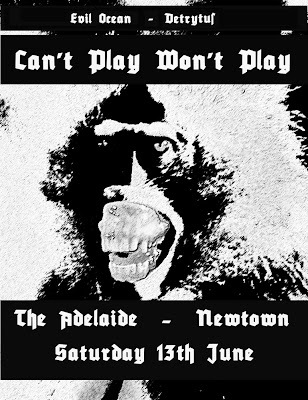 My BF's band is playing next Saturday (13 June) at the Adelaide along with a coupla other bands. Dave's band is Can't Play Won't Play and they play alongside Evil Ocean (who has been played on my show on more than one occasion) and Detrytus. Should be a fun night! It's also a chance to celebrate my friend's 40th. God, we are all getting old.